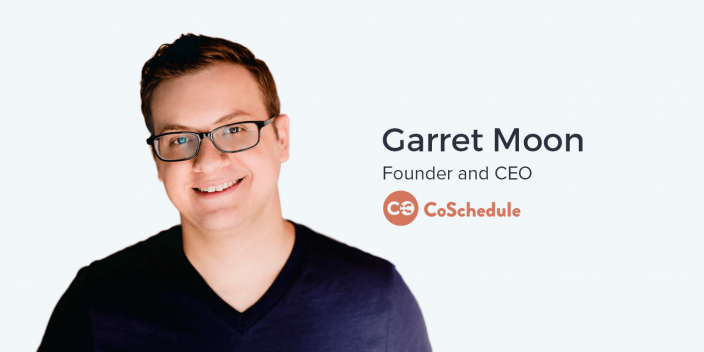 Garrett Moon is the founder and CEO of CoSchedule, a calendar SaaS product for marketing teams. Previously he cofounded Todaymade, a web design and applications development company that was acquired Agency MABU. Garrett founded CoSchedule in 2013 out of Bismark, North Dakota. CoSchedule is a marketing calendar to help manage content marketing, social media scheduling, and marketing projects for teams and agencies. Over 4,000 blogs and businesses use CoSchedule to manage their editorial calendars and campaigns. The value proposition of your product and how it solves a problem to your users is incredibly important for obvious reasons. However, the unique value of your marketing itself is frequently overlooked. How does your marketing actually stand out from other companies’ marketing? That’s a lot harder to do. It’s not necessarily harder to do… I think it’s just something that people kind of forget to consider, forget to think about. You read all of these tips for making better content or how do you get better lead conversion or better calls to action. And if everybody’s following the same exact tips in the exact same way, you got everybody to do the exact same thing. Marketing is about breaking through the noise created in crowded business spaces. Finding the “blue ocean” to differentiate you marketing from your competitors is one methodology for standing out. While in some cases the right direction might be quite obvious, the decision of going niche or broad is one of the hottest questions asked by digital marketers across all channels, mediums, and industries. If you know something works, that one audience is converting well, why wouldn’t you put every single ounce of your resources into maximizing that use case, that user base? Why would you try to get ten other users at the same time if when you could literally, by focusing only on one, probably grow ten times more? Those potential customers who are more specifically interested are far more likely to spend money with your business in the first place than the broader audience of less-likely potential users for whom the product doesn’t meet their hyper-specific needs. The introduction of digital advertising and technologies created a massive shift in the fundamental way businesses think about marketing. Although, it may be hard to imagine a shift with that level of impact in the future, marketing is still changing. Marketing has changed. All marketing includes social, all marketing includes content and providing value in exchange for trust from your audience base. There’s a lot of convergence happening. Marketing channels are increasingly becoming integrated and dependent on each other. Content, paid media, and social media no longer operate autonomously within their own ecosystem. Each now directly impacts the other. As technology evolves, it’s possible that the future of highest level of personalization even includes genetic information, real-time health data, and that consumers opt into providing to ad networks to receive hyper customized solutions for their pain points. Ander: One of the many things that’s especially exciting about doing these interviews is getting to speak with the founders, or the marketers, or the masterminds, or whatever you want to call them, behind the products that we use here at Instapage, and CoSchedule is certainly one of them. And it’s a pleasure today to be speaking to their CEO, Garrett Moon. Garrett, how are you doing? Garrett: Doing great. Thanks for having me on. Excited to visit today. Ander: Yeah! There’s a lot of really cool things that we get to talk about. And you are calling from North Dakota? Garrett: Yes, absolutely. Our headquarters is in Bismarck and we have an office in Fargo as well, so we are a 100% North Dakota-based start-up. Ander: I’ve got to ask you… How many tech companies like CoSchedule are there in North Dakota? Garrett: There’s actually a pretty good tech boom going on in our state. Emerging Prairie is kind of a big group that works out of the Fargo area. They do a ton of really great work right on I-35 there. It’s kind of a booming place. Garrett: A lot of people don’t know this, but North Dakota actually has a legacy, a Microsoft campus in Fargo. Garrett: A really nice tech legacy from back in the 90s. There’s a big exit of Great Plains software to tech. And our Governor is actually a tech entrepreneur as well and was involved in that, or started that, company that was sold to Microsoft. North Dakota has a great tech legacy and our start-up community is really booming in the state. Many more to come, I hope. I explained it a little bit in the introduction to this podcast, but let’s hear about CoSchedule. What is CoSchedule? What does your product do? Garrett: Yeah. We really think of what we do as marketing project management or marketing organization. There’s so many channels that marketers have to take into account these days, obviously with social networks. But also just their own website, their own blog content, email marketing, automated content that they’re working on, content partnerships, guest blogging, and all of these different places where marketers are publishing to. It can be really a challenge to see everything you’re working on in one place and have a good visual of what your marketing team is actually trying to accomplish. Garrett: That’s really where our bread and butter is and we do that by providing a tool that helps with scheduling. We are a full social media scheduling tool. We have great integrations with sites like WordPress that allow you to schedule and execute all of your content and social right from a single editorial calendar. And for teams, we add a whole layer of workflow management tools and discovery tools that allow them to make it the marketing calendar of record for their entire team. When you started CoSchedule, what was your theory or your philosophy behind marketing in general and behind what you thought actually might work for CoSchedule? Garrett: That’s a great question. The theory was really just that more of this activity should be connected. We started with a very simple idea. Every time we publish a blog post we schedule social messages to promote that blog post. And then we also schedule social messages to promote that blog post a couple days later. You re-share that content a couple days later, maybe a week later, or even with evergreen content, a few months later. When we publish in a blog post, we do this every single time no matter what. It’s super repetitive. There’s got to be a better way to simplify that. We started thinking about just that one time stamp in a marketer’s day and how we could make it as simple and as easy as possible. A lot of what we’ve done since has just really blossomed from that same idea. But that was it; that was where we really started to put it all together. Ander: That makes perfect sense and as somebody who is a marketer, as somebody who has used your tool and uses it regularly to be honest, that totally resonates with me. What about growing CoSchedule itself? How did you think you were going to get this company to the point that it is today and how has that changed between now and then? Garrett: It’s a great question. I think right from the beginning, inbound marketing was going to be our strategy. Really using our tool to do exactly what it was built to do and putting it to work for ourselves. That was goal number one. We focused heavily, early on, on our blog and our email list and building an audience that way. Nothing too fancy, stuff that people talk about every single day. We had some specific tactics and things that we used to differentiate ourselves. That was really important. By and large, that was the focus. As we’ve grown, that email list and that audience-building process and inbound process is still a massive piece of what we do. I would say by and large it’s stayed the same. The KPIs and some of the things that we measure and look at have changed a little bit. You know, you start thinking more about leads and sales qualified leads. Ander: LTV and stuff like that. Garrett: Yeah, and customer segments as you mature a little bit. But boy, in the beginning it was 100% about audience acquisition. Ander: And how did you approach that? How did you build your email list? That was obviously a big part of your growth and your success. What did you find was most effective for doing that? Garrett: One thing I would say is we made it the only metric that mattered for our marketing team. Basically the only real KPI and thing that we measured for the first couple of years was the email list size. I always really like to have extremely clear singular metrics that you take a look at rather than having a dozen different numbers. If you’re looking at email list growth, my feeling is that if you do the right things, the right things will happen to make it successful otherwise. Now, there’s ways that you can get the wrong type of growth, sure. Most of the time that doesn’t happen when you have a team that’s smart and dedicated. So one, we just focused only on email list growth. That’s the number we measured every single week and that’s the number we talked about. From there, there’s a ton of different things that we did but a lot of them revolve around your typical lead gen type of stuff. One is free tools. We have CoSchedule plugin and we have the headline analyzer, which is a really popular tool for analyzing and making sure you have the best headlines and most shareable headlines on your blog or for social media. With those tools, we would attach an e-book. Sometimes we would make them give us an email to use the freemium tools. We collected tens of thousands of email addresses that way and built that audience that way. The other one is that every single post on the CoSchedule blog probably for the last year-and-a-half, two years has included a downloadable resource. We don’t release content where you can’t download something like an infographic. We focus on actionable content. We like to have worksheets where you can actually download that worksheet and execute a plan or brainstorm or work through some of the things that you learned in our blog post. How have you integrated advertising into this growth? Whether it’s paid social or AdWords or even direct media placements. Garrett: So we really haven’t focused a lot on that at all. In fact, for the first couple of years, we did almost no paid. Now, I’d say there’s off and on times where we experiment with doing paid placement for signups. We also did some for list growth where we would just put $25 bucks behind every post we would do for a while just to promote it and get a little further reach. Those were ok. We always have this 10X versus 10% principle out of this framework. So we were thinking about it in terms of the things that we can do in list growth that give us 10X growth, that multiply our list by ten times, versus what are the things that are good and can give us incremental improvements. But those are the 10% things. And I would say most paid opportunities most of the time fit into that 10% category where they’re not going to change the world for you. They’re not going to hurt you, but they’re not the end all, be all. There’s probably better things that you could be concentrating your time and energy on. Paid was never a major strategy for us. Now as we’ve gotten larger, we have more resources, now we do a lot more of it. Now it’s a 10X opportunity partially just because of our size and the weight that we can put behind it when we do it. Ander: Yeah, that’s super cool. What do you find are some of the marketing challenges that are unique to a product like CoSchedule? CoSchedule is obviously in a league of its own. As every company does, it has its very own very unique category. However, what are some marketing challenges that are unique to SaaS companies or social media scheduling tools? Garrett: I think in this day and age it’s differentiation. That really becomes a big problem. You and every single other SaaS company are doing content marketing and inbound marketing as a growth channel. The secret’s out. You’re not going to grow just by doing it. You really have to figure out how to approach it in a way that’s going to be really different from how somebody else is going to do it and allow yourself to get individual traction. I’d say the biggest challenge these days is differentiation and actually making it work because just doing it isn’t enough. Ander: I totally hear what you are saying. And differentiation is something that obviously that we all struggle with as marketers. How do you identify what your unique value proposition is among all these other tools? Garrett: Well, I’d say there’s two things here. You have to have two value propositions. One of them has to actually exist for your marketing. And I think this is the one that people miss the most often. Finding the value proposition for your product is actually a lot easier, right? You can see what other products do, you can hear and listen to what your customers are saying to you and understand the value that they’re getting from your product. And, you can translate that into your marketing message. You should totally do that. That’s really important. And most product people and most companies will do that pretty naturally. You have to differentiate yourself somehow. I’d say the bigger one is how do you differentiate your marketing. How does your marketing actually stand out from other companies’ marketing? It’s not necessarily harder to do… I think it’s just something that people forget to consider and forget to think about. There’s a book called ‘Blue Ocean Strategy’. Many people have probably read it. The angle of that book is absolutely about trying to figure out how do you differentiate your company and your brand. What we’ve started to do is take that same approach and apply it to our marketing and the content that we are creating. How does our marketing have a blue ocean strategy? We are in a world where there’s millions of pieces of content going out every single day. How do you stand out? How do you make a brand for yourself in that? So we defined, for our own blog and our own content, a blue ocean strategy that says here’s the things that our content does that other people aren’t willing to do. We can do that makes us stand out from the crowd and build our list ten times faster than they’re building their list. Ander: That is a perfect segue into my next question about blue ocean strategy. I’m so glad you brought that up. For anyone who has not read the book, how would you describe it at a very, very high level? What is the essence of ‘Blue Ocean Strategy’? Garrett: So, ‘blue ocean’ is the opposite of ‘red ocean.’ ‘Red ocean’ means that the water is bloody with competition. It’s the simplest way to say it. Blood sticks out in people’s mind, right? It’s a powerful word. When everyone’s doing the exact same thing, me-too type of content marketing, that’s red. That’s red water. That’s bloody with competition. Everyone’s competing and fighting against each other and the problem is that when you’re in a red ocean, you are guaranteed to be doing 10% projects almost all the time. It’s very, very difficult to get out and to make a 10X improvement when you’re doing the exact same thing as everybody else. There’s a lot of that, right? You go on everybody’s blog and you read all of these tips for making better content or how do you get better lead conversion or better calls to action. When everybody’s following the same exact tips in the exact same way, and you’ve got everybody doing the exact same thing, that’s what makes a red ocean. ‘Blue Ocean Strategy’ is saying, ‘Ok, what is your blue ocean? What’s the wide open expanse where you can grow? Where’s your 10X opportunity? It’s the type of thing that nobody else is doing, somebody else hasn’t thought of, or your differentiating factor that’s going to make your marketing, or your business, 10X more effective than somebody else’s. Ander: One thing you mentioned that CoSchedule does, which is really cool, is including a downloadable asset in all of your blog posts. Do you remember the moment that that occurred to you or somebody on your team as an excellent idea, a really unique way to find that blue ocean within your marketing? I think there’s always a hesitancy, in content, to ask. People get tired of the pop-ups and everything. And usually, I think, that’s actually because they’re just bad at implementing them, not from a technical standpoint, but why the heck a user or a visitor would care about your pop-up? You have to figure out how to angle the content or the sign-up for them correctly. I think there’s an opportunity where you start realizing that you can ask more aggressively than you probably are right now. Once you start doing that and see how well it works, it becomes a no-brainer. Those are the best types of marketing decisions, the ones that are easy to make. Garrett: There’s two categories, right? There’s that passive type and there’s tons of that. And a lot of times what happens is they actually are creating really good content that’s really interesting,and provides a lot of value, and they’re just not being aggressive enough. They can ask more, right? And then there’s also the other side of it where you see people being extremely aggressive but they’re not backing it up with anything. Garrett: It’s not valuable enough, it’s not good enough to where I’m willing to trade my email address for your content. No thanks. I’ll live without it. They’re not finding that blue ocean. I think it’s a combination. One, you’ve got to find your blue ocean. And then two, you have to ask, you know, three times as much that you think is reasonable. And what you’re going to find is that if you’re in a blue ocean, people will absolutely follow those call to actions. They will sign up, they will respond to your call to action with no negative side effects. I mean, it’s all positive, usually. Ander: How much of finding that blue ocean is about finding the unique user base for your product? There’s a debate that I know a lot of marketers have. Do we go niche or do we go broad? Garrett: Well, niche is always easier, right? Ander: Right, in many cases it is. Garrett: Generally speaking, you should go with what’s working. That’s the advice. I think sometimes what happens with that conversation is we forget how big the world is. We forget how many people are out there. There’s really no reason that you have to go broad for just about anything. Niche is big these days, particularly with an online audience, so I think that’s more about creating focus for yourself. What’s working really well?’ Figure out what are my top ten customers that keep buying more, upgrade the most, or seem to convert the fastest. What use case are they buying? What’s the job that they’re hiring our product to do? Their title and their location might be some things. But most of the time it’s more about what problems we are solving for them. Why are they hiring us to do this thing? Once you can understand that, then that’s the niche you want to focus on very, very heavily. And then once you start doing that and you maximize in that once audience, you have the opportunity to start thinking perhaps about other verticals or other audience types, or you could duplicate those types of efforts. Focusing and getting really good on specific customer use cases or customer segments I think is really, really important. Again, 10X versus 10%. If you know something works, that one audience is converting well, why wouldn’t you put every single ounce of your resources into maximizing that use case and that user base? Why would you try to get ten other users at the same time if when you could literally, by focusing only on one, you could probably grow ten times more? Ander: And, where is all of this going? What is the future of marketing? What do you think it’s going to take as more technology comes out? As more products, more services, and more tools become available to marketers, what do you think is going to change? And how can we embrace those changes? Garrett: There’s two big changes I see. One, is look at how social media marketing has entered into the marketing vernacular. Ten or twelve years ago, social media marketing was this special thing. Every company was hustling to try and hire a social media manager, and they’d just hire the youngest person they could find and assume they were good at social media and stick them on the job. Garrett: Social media marketing was almost like a separate department. You think about it in terms of a marketing team… There was a marketing team and then they added a social media department, or a social media group to that. I think a lot of people kind of expected a similar type of activity to happen with content marketing and it would become a separate vertical and a separate thing. I think, the way I see it, is that’s probably not ever going to happen for content marketing. It’ll never be the type of team. In fact, what’s happening is all of those things are converging together and that’s just ‘marketing.’ Marketing has changed. All marketing includes social and all marketing includes content and providing value in exchange for trust from your audience base. I think there’s a lot of convergence happening. Now, from our perspective we see that is this type of marketing is coming together. What that means is marketing management tools need to be really good at social because social is going to become part of every single marketing project they ever do. Ander: Yeah, it’s all integrated. Garrett: It’s all integrated. And the other point of that is the channels are only multiplying, right? We have all these social networks and we add a few every year. But there are other channels as well, like content partnerships, webinars, podcasts, videos, live streaming on social networks, and other stuff like that. All of these new things are coming and what marketing teams are really going to need to get good at is being able to balance all of them. How do you create a similar message and a similar brand across all of those different channels consistently? How do you incorporate social into every aspect of your marketing so it’s not this after-thought or it’s not just this thing that one person does in your office? Those are the big problems that I think marketers are going to have to be solving and figuring out in the next couple of years. Garrett, it has been a pleasure having you on this podcast. Thank you so much for taking the time to come on out of your busy schedule. One thing I like to ask everybody who comes on the show is, what we can do as marketers to benefit the marketing community as a whole? Perhaps that’s checking out CoSchedule, perhaps that’s something else. Any ideas are appreciated. Garrett: Thanks for the opportunity. Always fun to come on, and these are subjects that I love to talk about. As I was saying with marketing and the way we’ll be seeing that world really changing, we really think that CoSchedule is right on the forefront of that, and we certainly hope to be. So, if you need that calendar and that place to put everything and get a good bird’s eye view of what your marketing is doing, that’s really what we’re trying to provide. Plus, eliminating copy and paste marketing – I know every single marketer out there knows exactly what I’m talking about when I say that – you schedule something in an Excel spreadsheet or in a project management tool and you someday have to copy/paste it out. We want to eliminate that. But I guess you’re kind of really talking about how do marketers help each other, how do we help each other and improve the community? I think marketers tend to be really good at this, and I think in some ways ahead of time. I think we’ve learned the secret is that sometimes we just share what’s worked for us all the time and we continue to be that open book and put it out there. That’s what we do at CoSchedule. We publish e-books on things that we’ve tried that make us, you know, help us collect more leads and improve conversion rates and all of those types of things. I think what people need to do is continue providing value and continually asking yourself all the time for the marketing you’re producing and the things that you’re putting out there, what’s in it for your customer? What’s in it for my industry? How am I providing value? I think as long as you’re always doing that and giving back in that way, you’re going to probably find a path to success. Garrett, once again, thank you so much for coming on the show. It’s been a pleasure having you on and I hope to speak to you soon. Garrett: Yeah, thanks. The pleasure was all mine. It was a lot of fun.